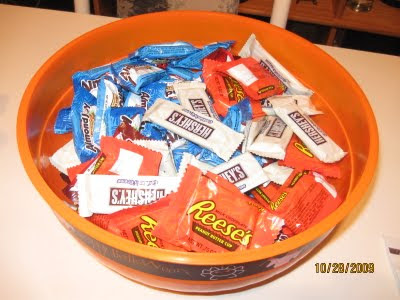 These are the candies for our trick or treaters that some never showed up. I don't know why, now that we have bought so many candies than last year, there were only at least 5 batch of the trick or treaters showed up. We bought some Reese, Hershey, Almond Joy, Peanuts and more. I was kinda upset because I was really excited to see those kids with their costumes. That really amuses me. But oh well, maybe next year would be totally different again. When I take a look outside that house I can barely see kids walking and passing the house. I am not sure why. We even put sign board and welcome them to our house. But that's okay well just wait for another year. Might be not the same. pang hatag na dre sa akoa anak.. LOLZ..
next year maybe different sis. when that time comes your baby will be joining them already. hows your preggy life sis? missec chatting wt u sis. many things have happend to me na. and maybe in yours too. daghan ko opps kay PR3 man .. first time nko nka PR..